The Louisiana Museum of Modern Art in Humblebaek, Denmark, has just opened an exhibit entitled Colour in Art. They combined works from their own collections with others lent by major collectors, Werner and Gabrille Merzbacher, to explore the role of colour in art and thus in daily life. Colour underpins most artists' concepts in some form or another. The most obvious domain of colour in art is in paintings, done in many media. The perception of colour has changed considerably over the last 150 years or so, as societies and cultures have evolved. There has also been a huge evolution in the actual production of pigments and types of paint, which have increasingly allowed more brilliance and a more flexible approach to the creation of art. Colour choices can be very personal, as we all know from the famous example of art to match the sofa demonstrates. Every choice we make in decorating our home is involved with colour in some way or another. So it is is no surprise that for an artist, the absence of colour (in a monochromatic work) or its presence - and in what fashion - both dictate a great deal about the creation of that particular work of art. Once created, artwork will then appeal to people through the colours used, to a great extent, whether the collectors and viewers realise it or not. Moods are created through a certain spectrum of colour, and people respond to those harmonies, even if only subliminally. The Fauves - Andre Dérain, Henri Matisse, Raoul Dufy, Albert Marquet and others - used a bright, almost strident palette of broken colour to evoke the brilliant light and intensity of colour in the landscapes of the French Mediterranean coast. Nothing downbeat at all. 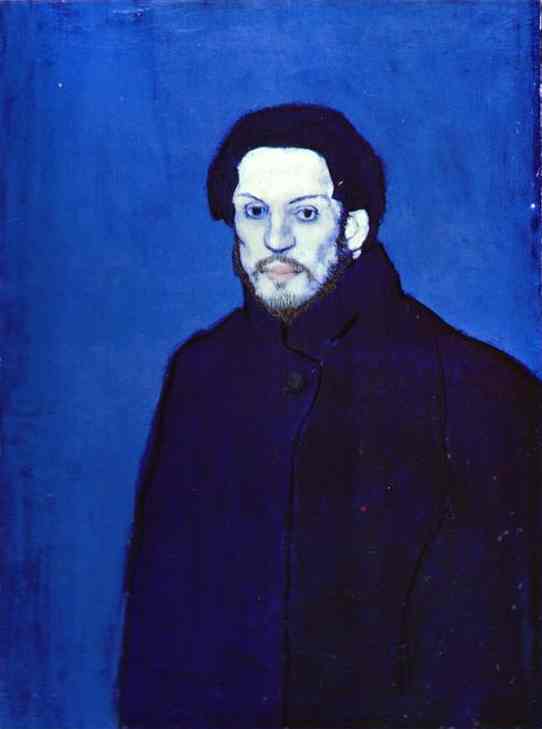 By contrast, Picasso's Blue Period paintings are almost monochromatic and convey deeply gloomy and sombre sentiments. Picasso's close friend, Carlos Casagemas, had committed suicide in Paris in 1901. This affected Picasso deeply, and the resultant paintings of that period use colour to convey the melancholy and resignation he experienced. The exploration of colour intensified as the artists of the mid-19th century began to move outdoors from their studios (mostly set up with northern constant light). They then got all excited about conveying the brilliance of light and its ever-changing qualities, when they worked plein air. After the Impressionists had pushed out the boundaries of colour use and perception, the field was wide open for everyone to experiment. Thus the Fauves and everyone else who followed, up to our time. Meantime the development of new artificial pigments, types of paint binder and their presentation in the marketplace were following a parallel explosion. This is explored in the Louisiana Museum show, Colour in Art. There is also the interesting dimension evoked of the commercial use of colour, for logos, advertisements, etc., and the same colours used in art. As is cited in the article on this exhibit on ArtDaily.org, the blue which Yves Klein developed for his famous brilliantly intense canvases would be unlikely to be confused with the blue used in the logos and names of the United Nations, the European Union or even Nivea cream. In other words, context of culture influences our perception of colour. I am sure that in our digital (and globalised) age, where colour is intensified even more than previously, even cultural perceptions are constantly evolving. Nonetheless, there is another dimension to colour, particularly in art. I found it an interesting juxtaposition to read about the Colour in Art exhibition and very soon afterwards, to find the following quote by Marc Chagall on Renée Phillips' Manhattan Arts International website: "In our life there is a single colour, as on an artist's palette, which produces the meaning of life and art. It is the colour of love (my emphasis)".